Boaters from all around the Great Lakes cruise from Lake Michigan into slips at Terrace Point Marina on Muskegon Lake. A great place to develop boating friendships in a comfortable and festive atmosphere, the clubhouse includes a kitchen, dining, living and laundry and is just 8 feet from the shore for convenience and views. Also enjoy 6 private showers, bathrooms, and dressing rooms are newly renovated. Enjoy fun and sun at the outdoor pool and picnic area. Or, head off to the indoor pool and hot tubs at the Shoreline Inn. 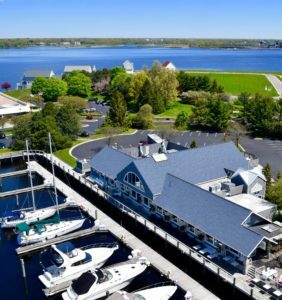 Terrace Point is the only marina in West Michigan with all of these amenities. Pools are large enough for laps and water play. Decks for sunning. Automatically adjusts to changing water levels and boat heights, assuring access year after year. Extra wide main and finger piers. Traditional nautical appearance and better protection for your vessel. Snacks, beverages, personal items, cameras, sun tan lotion and beach supplies are available for purchase during your stay. Game room and fitness center and pontoon boat rental available.